Creepy Magazine's "The Tell-Tale Heart"
"Humpty Dumpty by Edgar Allan Poe"
Looking to buy a new home? You may be in luck. 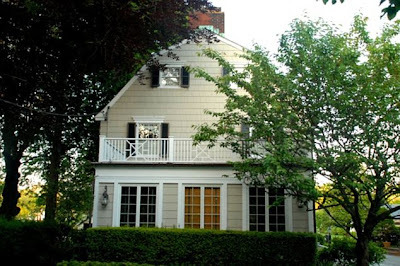 The "Amityville Horror House" has gone on sale in New York state. Brought to fame by the 1975 crime in which Ronald DeFeo Jr. murdered members of his family, and the family which later moved in and the novel and numerous film adaptations they inspired, the house will set you back a mere $1.15 million. The five-bedroom Dutch Colonial went on the market Monday. Whether or not you believe (or have even followed) the saga of controversy over the experiences of the Lutz family when they lived in the home after the murders, the story of the Amityville haunting remains one of the most enduring accounts of a haunting in modern American folklore. The book, which catapulted the story to fame, began after George and Kathy Lutz, the alleged victims of the haunting, were introduced by a book editor to Jay Anson, the book's author. Since it's publication, the story of the Lutzes has received harsh criticism, including a debunking of several claims of damage made by a couple who bought the house in 1977 on the television show "That's Incredible." Local Native American leaders have also denied claims made in the book that the local Shinnecock tribe once abandoned the mentally ill and dying on the land which would late become the house. However, even in the face of these criticisms, though it was proven there was no snow on the date in which the Lutzes claimed to find cloven foot prints outside their home, the legend lives on. Most recently, The History Channel broadcast "Amityville- The Haunting and Amityville- Horror or Hoax?" in October 2000. In the documentary, George Lutz is quoted six years before his death as saying, "I believe this has stayed alive for 25 years because it's a true story. It doesn't mean that everything that has been said about it is true. It's certainly not a hoax. It's real easy to call something a hoax. I wish it was. It's not." And now, for a little vintage paranormal TV, going back to 1979 "In Search... of The Amityville Horror."